This is the perfect escape for those who appreciate comfort and fine dining but still want an active and unusual vacation. Horseback ride across flowering meadows, find hidden swimming holes, visit charming villages and enjoy a comfortable couple of days at the picturesque country inn we have selected especially for you. There is no better introduction to the remarkable Icelandic Horse than these 2-day trail rides that take you on a scenic tour of this special region of Vermont. You will be matched to a horse to your level of experience and we'll travel at a pace that suits you so that you can experience the horse's gentle temperament and smooth gaits and come to respect and appreciate the amazing animal that this farm has dedicated themselves to. You won't believe how much action is possible underneath you while you feel the sensation, as native Icelanders describe it, of "riding in an easy chair." For over twelve years now there has been a steadily growing herd of Icelandic Horses within the Mad River Valley of central Vermont. They live content and right at home amidst the majestic mountains, pretty waterfalls, crisp mornings of snowy winters and the luscious greenery of Vermont summers. 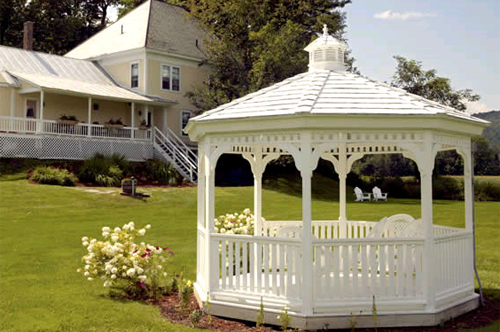 The Horse Farm, founded in 1988, has shown over 3000 riders charming New England at its best. You'll return home fit and rested, with the memory of newly found friends and shared adventures. The Icelandic Horse that gave you the overwhelming feeling of floating across the scenic Vermont countryside is likely to keep a special place in your heart forever. Getaways are available from Sun-Wed for 4day/3night and Wed-Fri or Fri-Sun for 3day/2night. Extra B&B overnights can be arranged. Rates do not include: Transfers, dinner on arrival day not included. Arrive at 4 PM on Day 1 - Departure in the afternoon of Day 3. Optional extra overnights can be arranged at an additional cost - please inquire! Day 1 Friday: Arrive late afternoon about 4 PM at the B&B which is a lovely 1860's Victorian country inn with cozy guest rooms, all with private baths. The inn boasts a swimming hole within walking distance, a recreation path, views of surrounding farmland, a BYOB bar in the family room with a pool table, and an outdoor jacuzzi tub. With as many as 30 restaurants in the valley we can be sure you will find one to suit your tastes for dinner tonight. Your innkeeper Luc can help you with your selection and send you in the right direction! Day 2 Saturday: After a three-course gourmet breakfast on our lovely back porch overlooking the gazebo you will be introduced to your horses and have a quick orientation. Then off to a day of riding. A picnic lunch will be served along the trail, with ample time for relaxing and enjoying the fresh Vermont air, before remounting for a fun afternoon of riding. Late afternoon is a great time for a swim, shopping, sightseeing, maybe a Jacuzzi, or if you wish a massage. We offer an on-call massage therapist who will arrive at the Inn to take care of any sore places. Dinner will be prepared and served by your hosts, who will join you for a relaxing meal. By this time you will appreciate the Inn's marvelous feather beds. Day 3 Sunday: After another fabulous breakfast, we are off to another full day of riding, more beautiful scenery, and another great picnic lunch. The ride will end at 4 p.m.
Day 1 Wednesday: Arrive late afternoon about 4 PM at the B&B which is a lovely 1860's Victorian country inn with cozy guest rooms, all with private baths. The inn boasts a swimming hole within walking distance, a recreation path, views of surrounding farmland, a BYOB bar in the family room with a pool table, and an outdoor jacuzzi tub. With as many as 30 restaurants in the valley we can be sure you will find one to suit your tastes for dinner tonight. Your innkeeper Luc can help you with your selection and send you in the right direction! Day 1 Sunday: Arrive late afternoon about 4 PM at the B&B which is a lovely 1860's Victorian country inn with cozy guest rooms, all with private baths. The inn boasts a swimming hole within walking distance, a recreation path, views of surrounding farmland, a BYOB bar in the family room with a pool table, and an outdoor Jacuzzi tub. With as many as 30 restaurants in the valley we can be sure you will find one to suit your tastes for dinner tonight. Your innkeeper Luc can help you with your selection and send you in the right direction! Day 4: Wednesday is a 2 hour ride in the morning after breakfast at 10 am. Each days ride is approximately 5 to 6 hours. Children over 10 years with riding experience are welcome if accompanied by a parent or an adult. Groups are kept small, 2-8 riders plus guides. The Saddles are quality English saddles made for Icelandic horses and are comfortable for the horse as well as the rider. Bridles have snaffle bits with drop nose-bands. Saddlebags and water bottle are available. On this stationary ride, all nights are spent at the same location. You are free to arrive at the Inn any time after 3 pm on Sunday or Wednesday.